If you spend any time at all pushing a stroller outdoors during the colder months, The Mommy Mitten will be your best friend. 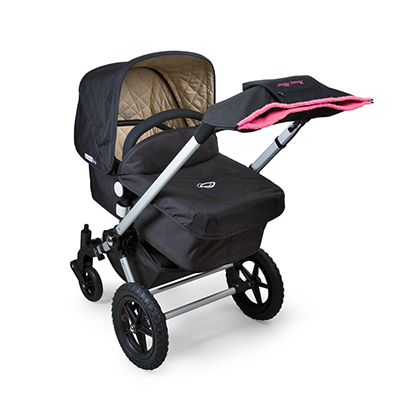 Water resistant, insulated and fleece lined, it is designed to wrap around your stroller handle to protect you hands from the elements. I have found that I cannot manage to deal with gloves when I’m out with the stroller. Between getting the stroller and my 4 children in and out of the car, I don’t even try to put my gloves on anymore. Even when we’re walking for an extended period I just can’t seem to wear them. As soon as I put them on I have to adjust something here or clip something there and off they come. Normally my hands are wrecked a day or two into the cold weather and they don’t recover until well into spring- dry. During these times, the Mommy Mitten makes my hands very happy. It keeps them warm and dry even in the worst weather and we have used it in some very harsh, wet and freezing weather this winter. Rock Them Gently With The Lolaloo!